The Zebra Corporation holds a competition each year for young designers where the winner gets their product produced under the Arbez name. The 2011 winner was the Piirto, an icepick-shaped ballpoint from a Finnish designer. In 2012, the British winner designed a set of pens around the London transportation system, with the double decker bus styled Eo 0.7 mm ballpoint taking center stage. The design of the Eo is fantastic. It is unique and eye-catching, but may not fit everyones grip comfort needs. One side of the barrel is flat, the opposite side is rounded, and the other two sides gradually connect the two. Essentially, a capital D shape. For me it works well, but others may not like it. If that doesn't bother you, then this is a fun pen to own. The bright red barrel features a slick white racing stripe running the length of the barrel, and both the tip and end caps sport a translucent ink color section. I find myself continually marveling at how well designed this pen is. 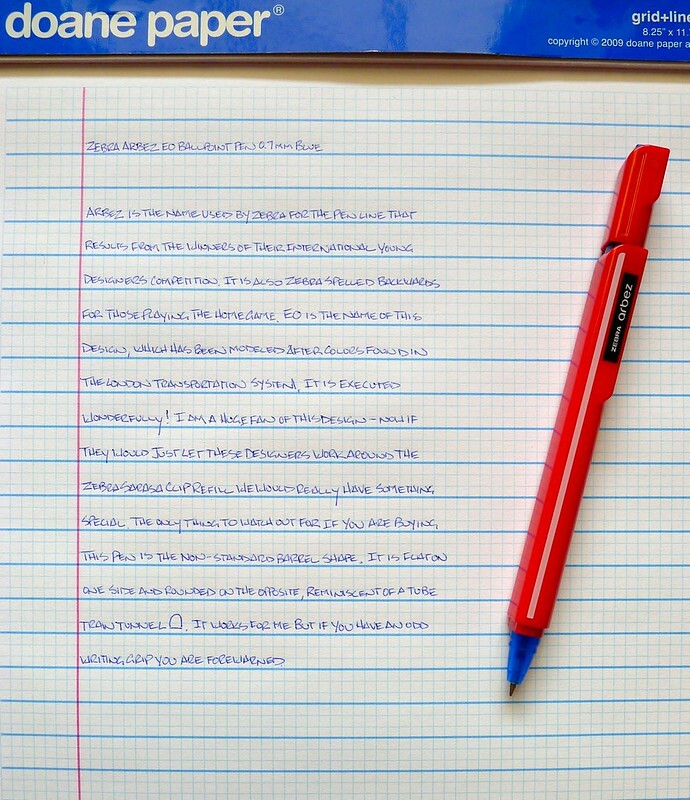 For a standard ballpoint it writes well. The lines are clean and sharp and very little white shows through. I enjoyed it but I wonder if the Arbez competition would be better suited to design around the Sarasa gel ink refill instead? Regardless, a part of London's transportation system now resides on my desk. Time to take a ride! Posted on September 5, 2013 by Brad Dowdy and filed under Pen Reviews, Zebra, Arbez.